When you pass by a demolition project what do you see? If you’re a demolition/salvage layperson, you may see piles of building material trash awaiting the landfill. But this is one of the most common myths about demolition—that it’s sheer destruction, with no new contribution besides empty space. The truth is that building demolition involves significant recycling. To compete, the modern demolition expert must understand how to recover as much worth as possible from a demolished building. Asset recovery is a key aspect in modern demolition. What is demolition asset recovery? Asset recovery is the science of extracting as much value as possible from buildings during the demolition process. –Plan asset recovery by outlining the structure’s salvageable assets, as well as their current market values. –Begin with a “soft sweep” of the property to remove equipment, fixtures, and finishing materials. –Next, recover the building’s structural elements. High reach excavators help demolition firms dismantle buildings safely, even in tight quarters. Explosives are rarely used—typically when there is no available space for demolition equipment. –Dry wall, rebar, and concrete are all recyclable, and demolition experts understand how to take down these building parts without compromising asset return rates. –Especially savvy demolition companies may maintain on-site concrete crushers, for transforming ubiquitous concrete into pipe fill, gravel, etc. In one of our projects, demolishing the Goldendale Aluminum Plant, we recovered more than 35,000 tons of structural steel. That represents a huge chunk of change for our clients, whose demolition fees were greatly offset through our asset recovery efforts. We use excavator shears and magnetic attachments to cut up and help sort metal building materials. We appreciate the real value hidden inside our clients’ defunct structures. That’s why Elder Demolition runs one of the largest scrap metal recycling outfits on the West Coast. 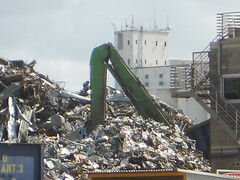 We handle this and other aspects of scrap metal demolition ourselves, rather than losing value to recycling middlemen. Our clients see the benefits—more asset recovery funds means less spent on demolition services overall. And the environmental benefit is huge, too. Our asset recovery contributes to the 80 million tons of scrap metal diverted from US waste streams every year. This entry was posted in Scrap Metal Demolition, Scrap Metal Recycling and tagged demolition asset recovery, demolition salvage, scrap metal demolition, scrap metal recycling. Bookmark the permalink.